Anyone have any experience with "Liberty Halo-Point Civil Defense Ammunition"? I just got an e-mail sale flyer for it from Midway. This stuff has VERY light bullets (50, 60, and 78 gr. for 9mm, .40, and .45ACP, respectively) at VERY high velocities (2000fps for 9 & .40, and 1900fps for .45). Supposed to give a solid 12" penetration, but fragment along the way. It's also supposed to produce very low recoil. I'd never heard of the stuff. Anybody have any experience or (objective) performance data on it? I'd like to try their .45 ammo because I love trying out different .45ACP ammo. It's $28.00 for 20 cartridges so it be a bit on the steep side. Liberty Halo-Point Civil Defense ammunition is a high velocity, extremely accurate load designed for self-defense. 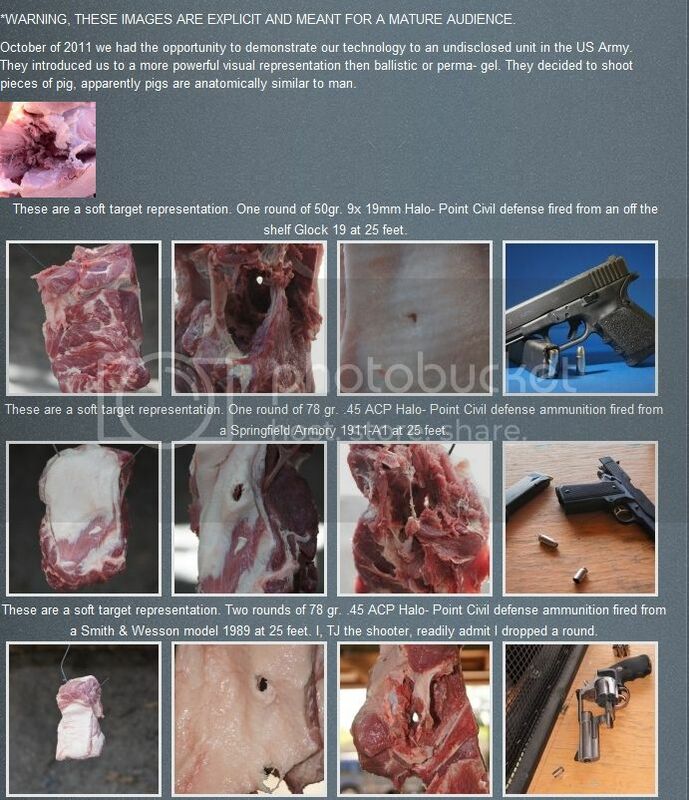 The 78 Grain Lead-Free Fragmenting Hollow Point bullet travels at 1900 feet per second, resulting in 12 inches of ballistic gel penetration and a permanent wound cavity greater than 5 inches in diameter. When tested through denim cloth into ballistic gel, this load penetrated almost 8 inches deep and produced a wound cavity 6 inches in diameter. This lightweight, high velocity round yields less felt recoil and has an effective range of 25 meters. This ammunition is new production, non-corrosive, and requires no weapons modifications. Muzzle Energy: 625 ft. lbs. I'm a bit leery of bullets that are that light. I may keep an eye on youtube and wait to see if anyone does any gel tests of these loads. Yes, I know gel tests are not the be all/end all of bullet performance testing, but I feel it gives a pretty good indication of how a particular load will do. Sounds like RBCD in new packaging...but the same old lies. They do have some gel and meat Pics on their website. Just FYI. "If I walk in the woods, I feel much more comfortable carrying a gun. What if you meet a bear in the woods that's going to attack you? You shoot it." Who is gonna afford enough of these magical bullets to establish reliable feeding - in all your magazines, for all your guns in the chosen caliber? I'm beyond skeptical when a business purports to have demonstrated their product to an "undisclosed unit in the US Army." Arborigine, ANGLICO, mkh and 1 others like this. Yes, I've seen them. I still remain a bit skeptical. I'm not saying the won't perform as advertised, I'm simply saying I don't know. And I'm not willing to bet my life on an unknown. I'm sure there will be some youtube videos that pop up using these rounds. I'll wait for them. In the meantime, I remain a "heavy for caliber" guy. I just bought a box of these in 9mm and have only tried them on the range with a S&W compact 9. Based on just shooting a paper target at 10 yards, they are certainly accurate. ...on a stupid note, they also weigh about half a normal bullet and as i carry everywhere, a couple ounces of savings may just be a mental game, but ill take it. I have actually tried the Halo Point ammo, and did a review of the .45ACP Halo Point on Midways website some weeks back. My Usual carry ammo is either HST's or Golden Sabers in 230 grain. so I had to rely on the website info. I would also love to see a YouTube vid of it as well. BTW: I don't have any affiliation with the company. Here's the complete review as posted. In this review, I would, like to bring up a few points that I think are being overlooked in the "light-n-fast" discussion. like saying "All 230 grain JHP's are the same". penetration and other performance factors. #2 There are other "Light and Quick" rounds out there that will get the job done. The FN Five-Seven is a good example. The newer Armscor 22tcm is also an interesting newer development. hit by any of them. In Fact, the Five-seven is currently in service with military and police forces in over 40 nations. Lets look at the specs vs a few other options. mods and/or purchasing another pistol is a deciding factor. That, and the 45ACP Halo is twice the weight at the same velocity. I know that a water jug isnt the best testing medium, but holy energy-dump batman! The 45ACP Halo decimates a jug. my Springfiels XDS. Both digested the ammo without fail. significant from the both the XDS and a Series 70 Gold Cup. Although the "heavy for the caliber" argument is a valid one to me overall, as a specialty ammo, I give it a thumbs up. I'd appreciate anything that lightens a Glock 30 mag full of 230 grainers, but I know the 230s will do the job if the time comes--which isn't good time to experiment. They sound way too light for me.